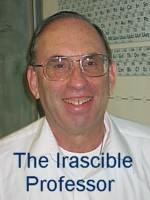 The Irascible Professor-commentary of the day 11-21-99. "And the Irascible Professor's award for stupidity goes to... ."
There is no sin except stupidity... ...Oscar Wilde, 1891. ...the bozos at Texas A&M University who permitted the tradition of building a bonfire of logs wired together and stacked around a central support pole to continue after members of their own engineering faculty had warned that this was an accident waiting to happen. The above photograph, which was taken after a collapse of the Texas A&M bonfire in 1994, shows clearly that rough logs that are wired together and stacked on end are inherently unstable. In this stack, stability depends on the lateral (inward) forces on the center support pole (the pole with the flag attached) being uniform around the stack so that the net lateral forces on the center support pole cancel. However, the rough logs, which are wired together can shift under the influence of small external forces (such as might arise from someone walking on the stack). Once this happens the lateral forces on the center pole become unbalanced. If the net lateral force on the center pole is large enough, collapse can occur. 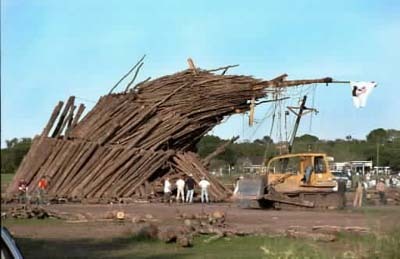 Clearly, the failure of the 1994 bonfire structure should have been sufficient warning to Texas A&M officials that changes needed to be made! However, "Aggie school spirit" appears to have won out over common sense and good engineering practice, and 12 fine young people died this past week as a result. If there is any good to come from this tragedy, it is the dramatic example of unstable equilibrium that the Irascible Professor will now use in his introductory mechanics course. He doubts that many civil engineering students will sleep through this lecture. � 1999, Dr. Mark H. Shapiro. © 2011 Dr. Mark H. Shapiro - All rights reserved.